"French chefs are, in the main, not adventurous," pronounces Thierry Marx from behind a billow of liquid nitrogen as he conjures up a perfect, yet unbaked, chocolate fondant. "While I respect the classics of French cooking, I like tasting new flavors and looking to the future." That's the kind of cuisine that awaits guests at the spanking-new Mandarin Oriental Paris, where Marx has been appointed executive chef. 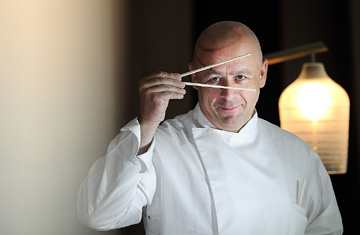 The 49-year-old Frenchman  named Chef of the Year in the 2006 Gault Millau guide  is keenly in tune with Mandarin Oriental's Asian sensibilities, having spent the mid-1990s working in Hong Kong, Singapore, Thailand and Japan. "I love the spontaneity in Asian kitchens," he says. Asian influence comes to the fore at the hotel's Le Camélia bistro with its teppanyaki counter and offerings of sushi and dim sum. At the intimate 45-seater gourmet restaurant Sur Mesure, Marx shows off his skill with seasonal, sustainable and local foods. Harking back to his early days as a pastry chef and chocolatier, he also offers highly creative desserts. Vacherin Nitro is eucalyptus meringue "cooked" in liquid nitrogen and served with apricot parfait; green-tea-and-chestnut terrine is accompanied by green-tea jelly and soy-milk emulsion; the Sweet Tomato plate comprises confit of tomato, tomato jelly, sangria soup and yogurt sorbet. "I see no issue in combining tradition and innovation," says Marx. Call it a Marxist coup. For reservations, phone (33-1) 7098 7888.